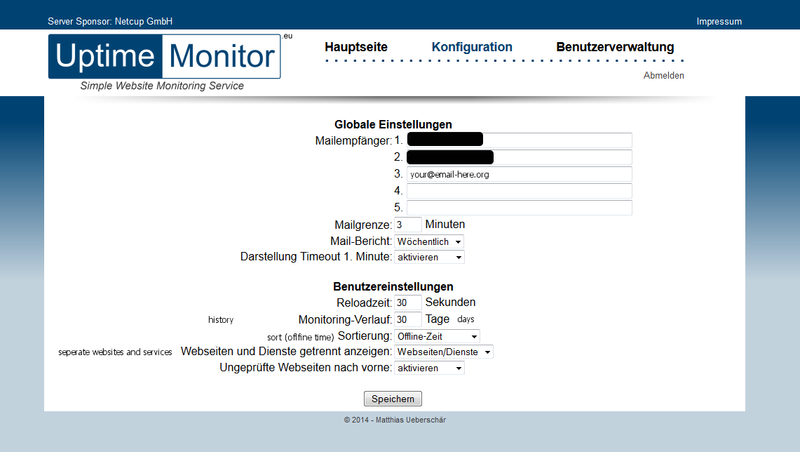 Tools to monitor aspects such as server uptime. This article serves to list various, free and paid, monitoring services which may be useful for server owners who need to keep an eye on their server's performance, make sure it's accepting connections, and watch over various other metrics. Services that monitor system metrics (such as CPU and RAM usage) typically require an agent running on each server to gather this information, so there will likely be extra installation work to use such features. Anyone is welcome to contribute and add to the list or update it as these providers launch new features, but please be sure to maintain an objective and non-biased standpoint. NewRelic specializes in monitoring the performance of web apps, allowing you to view metrics such as response time, requests per minute, error rates, and your Apdex (application performance index) score. A site's Apdex score correlates with how satisfied visitors are with the site's load time. NewRelic also offers free standard server monitoring for an unlimited number of hosts. Pricing: Free for server and basic web app monitoring, pro web app monitoring starts at $199/month. DataDog specializes in custom metrics and event logging. They have 50+ integrations already available and ready to use right away. They also provide custom dashboards so you can keep track of the important metrics. You can use HTTP/TCP checks (run from your machines, not theirs) to monitor Minecraft servers websites, among other services. You can also use their JMX integration to collect, graph, and alert you about specific JVM metrics for your server. Pricing: Free for up to 5 hosts, $15/host/month for up to 100 hosts. CopperEgg is great for monitoring websites and services (like Minecraft). It'll check these probes as often as every 15 seconds from multiple locations around the world. You can set up some pretty cool custom dashboards as well to keep track of the metrics that matter the most to you. Your apps can send in custom metrics as well. They have integrations for some popular services like MySQL and Nginx already available. Uptime Robot is an uptime monitor primarily built for websites, with various methods to detect downtime and report it to the user. It allows for monitoring http(s) connections, finding keywords in HTML, pinging the machine or checking a port. The last option is useful for checking if Minecraft servers are running, and alerts can be sent via email, RSS, or through their API. The service can monitor up to 50 hosts, and will check every 5 minutes at the minimum. 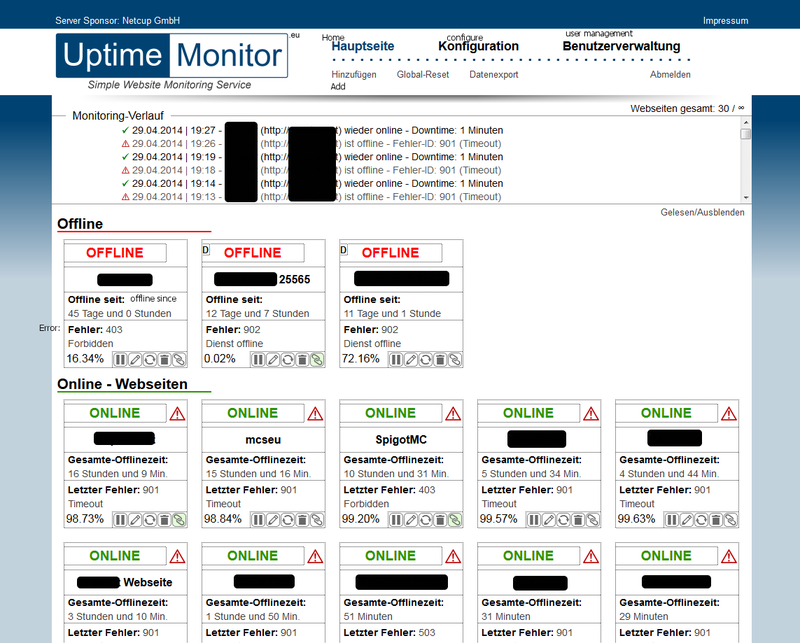 With uptime-monitor.eu, you can monitor 30 websites and services. It'll ping your service every minute and sends E-Mail notifications if it's down for more than 2 minutes (configurable). It has an clean dashboard and you can create realtime links to show your uptime on a website. An example can be found here. Pricing: Free for websites and services.